Even though we’ve been using the EcoRebates tools for a short time, we are already seeing impressive increases in ENERGY STAR sales – in some cases more than 50% - by providing this key information to consumers at the point of sale"
EcoRebates, the premier provider of custom ENERGY STAR rebate solutions for retailers, manufacturers, program administrators, and consumers, announces its latest retail client deployment with leading appliance retailer - Number1Direct by Goedeker’s. Deployed at the point of sale, the EcoRebates Rebate Locator - Retailer Edition provides Number1Direct’s consumers with the most up-to-date information about cash-back rebates on appliances, giving them a compelling incentive to purchase the most energy-efficient ENERGY STAR models. As one of the nation’s largest independent appliance retailers, for more than 5 decades Number1Direct by Goedeker’s has provided its customers a large selection of name-brand appliances and electronics at low prices, striving for 100% customer satisfaction. Number1Direct can now help their customers save even more time and money through its deployment of the EcoRebates Rebate Locator tools. Available rebates found by the EcoRebates search tool – from states, utilities, municipalities and manufacturers - can range from $25 to more than $500. 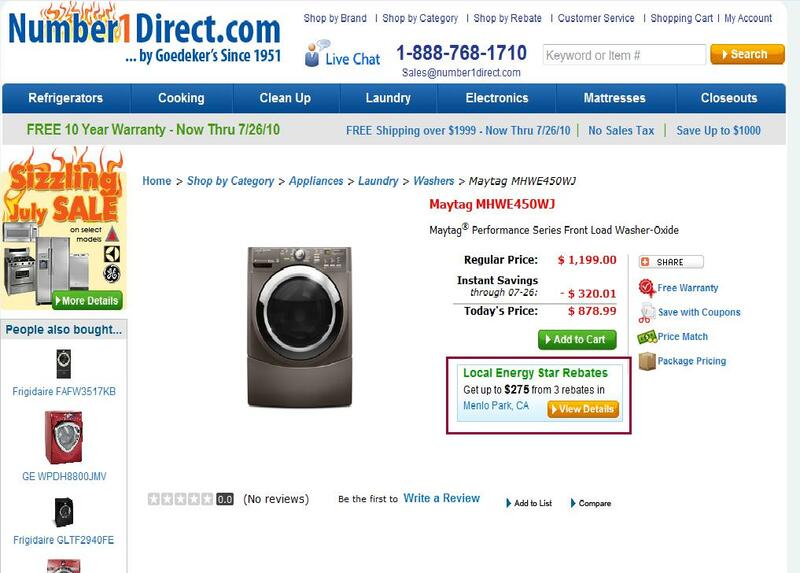 Easily deployed on the Number1Direct website, the EcoRebates search tool automatically gives shoppers information about all rebates available where they live for ENERGY STAR products by SKU. It provides key program details, such as recycling requirements and qualifying dates. Armed with this information, consumers can quickly access hundreds of dollars in savings per product that most consumers probably did not know about previously. The EcoRebates Rebate Locator draws from a continually updated database of more than one thousand of energy-efficiency rebates from utilities, water companies, state/local governments and manufacturer's, including the $300 million state “Cash for Appliances” programs and the pending federal Home Star home energy retrofit program ("Cash for Caulkers"). Founded in 1951, Number1Direct by Goedeker’s is one of the largest independent appliance retailers nationally. In business for nearly 60 years Number1Direct have helped hundreds of thousands of satisfied customers with their home appliance needs. Now in its third generation, Ballwin MO – based Number1Direct is committed to customer service, honesty, and integrity. Ecorebates.com is a comprehensive information resource designed to help the consumers become more environmentally aware and make the best energy efficient appliance, HVAC and whole-home product purchase decisions. Deployed as a customizable ‘software as a service’ for leading retailers, manufacturers and utilities, these solutions give consumers the rebate information they need when they need it, when researching what to buy or at the point of sale. For more information, visit ecorebates.com and follow @ecorebates on Twitter.